How To Achieve Perfectly Toned Arms By Doing These Few Simple Exercises. Even though the LF2 vibration plate is a great way to tone up all over the body, some people find that the arms don’t get much vibration or results, but don’t worry, we have a way to help you tone up those arms using the LF2, and it only takes 10 minutes on programme 3. The LF2 will speed up every 2 minutes, so the exercises get gradually harder, with the final 2 minutes at it’s highest speed. Here are the instructions for a full upper body and arm exercise. 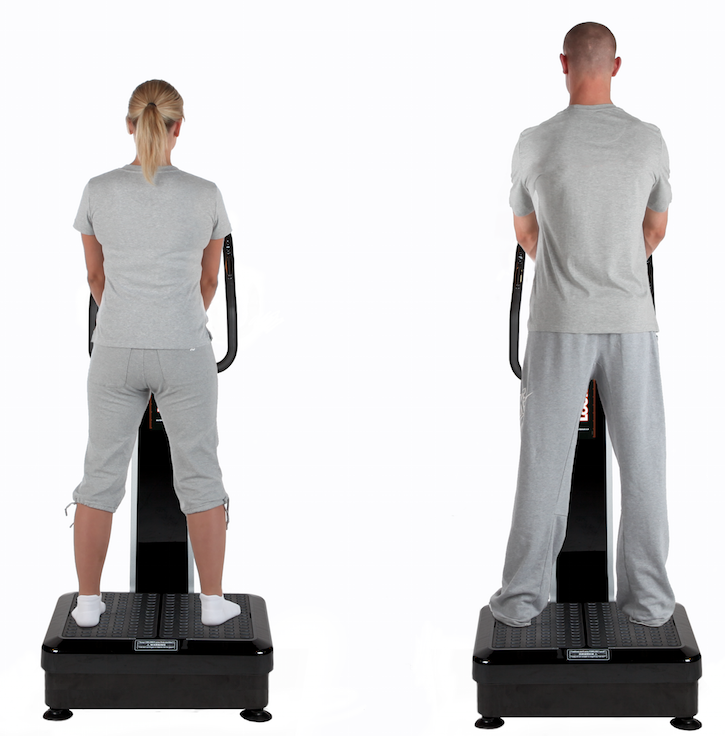 Firstly, to begin, all you’ll need is the LF2 vibration plate. Make sure it’s plugged in and select the P3 button on the display. P3 stands for Programme 3, which is a more intense workout, for people who are looking to work on particular parts of the body, such as arms. Have enough space to enable you to do the exercises comfortably. We usually suggest a 3ft x 3ft wide space. We suggest you should wear socks, rather than being bare footed. Now, press start on the display. Then get into the position shown below. This exercise works the back of the arms, shoulders and chest. Have hands on the front of the base of the machine, with fingers hung over the edge. Bend the arms at a 45 degree angle, then lift the bottom off the floor keeping knees bent. Once this 2 minutes has been completed then move into the next position shown below. This exercise works the front of the arms, shoulders and chest. Hold on to each side at the edge of the base with hands, with fingers hung over the edge. Keep elbows soft and back straight, keep the feet and knees together, slightly raising feet off the floor. Change into the position shown below for the next 2 minutes. This exercise works the arms, chest and shoulders. Place hands and lower arms flat on the base with fingers hung over the back of the base, bend arms at a 90 degree angle. Keep back straight and knees together. For the final position stand on the LF2 Machine as you would normally for overall conditioning. Stand with feet as far apart as possible, relax body and muscles and hold onto the handles. Hold for final 4 minutes. Following this intense programme will give you the toned arms you’re longing for, as well as doing wonders for the chest and shoulders. For ease of access to these exercises then download our App here, which works alongside iPhone and SmartPhones. Our Facebook and Twitter pages are updated regularly with images such as these ones, and also posts about upcoming competitions and special offers. Make sure you follow us on both so not to miss out! This entry was written by lookfabulous2, posted on May 19, 2015 at 1:56 pm, filed under Uncategorized. Bookmark the permalink. Follow any comments here with the RSS feed for this post. Post a comment or leave a trackback: Trackback URL.